So, I've decided to start a new feature just for fun, and as another way to highlight cool toys. About a week ago on Instagram (you can find me @Little_Weirdos7 if you aren't following already), I began posting a pic of a single monochromatic mini figure every day as the "Mono Mini of the Day" (among the other stuff I upload there). 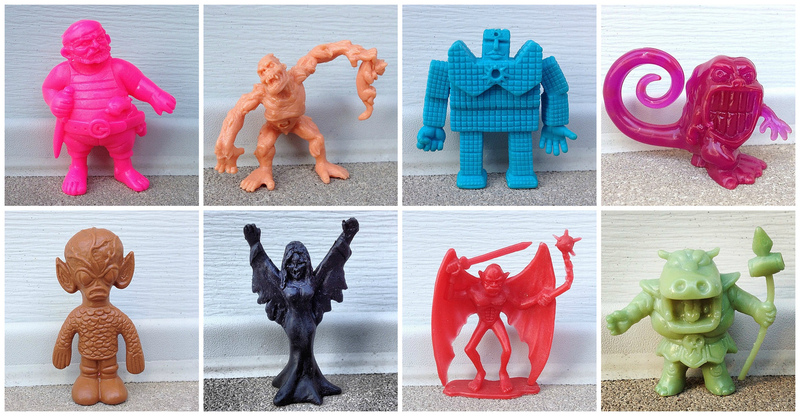 This includes popular stuff such as Monster in My Pocket and M.U.S.C.L.E. to the obscurest of the obscure mono minis. Then, every 8 days I will compile the most recent Mono Minis of the Day and post them here as well, in one of those fancy collages like you see above. 2. The Ape from Z.O.M.B.I.E. 3. Sunshine (#64) from M.U.S.C.L.E. Just discovered your site about a week ago and wow! It is nice to know I am not to only addict of these kinds of figurines out there. I have an obsession (borderline clinical disorder) for small plastic collectables, plastic bugs, dinosaurs, wrestlers, ninja, etc. and especially M.U.S.C.L.E. figures. I also have mini vending machine transformer bootlegs/knockoffs though I don’t have very many of those…yet (ebay surfing as we speak!) I also have a huge bootleg vinyl Godzilla figurine collection too as well but have not found any sites out on the Internet about those yet. Oh well. Keep up the good work my friend. It is much appreciated! Oh yeah almost forgot: THE 80's & 90's ROCKED!!!!! Thank you for your kind words! Glad you enjoy! Thanks for posting the demon! I had one of the DFC sets when I was younger and had no idea what it was called, just remembering the figures.